And urban oasis complete with attentive cabana host at your beck and call. 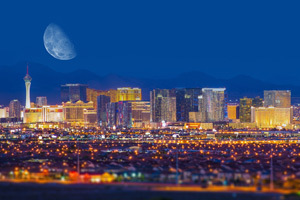 The off-Strip location gives you a broader twinkling city vista. With 24/7 valet service and a doorman downstairs, you'd expect the interiors to look like this (and they do!). You're never far from the glitz-and-glam at just a mile and a half from the strip. Enjoy the lively rooftop pool scene, plus the the main Palms Pool & Dayclub is a non-stop party. Poolside bar keeps the fancy cocktails coming. The luxurious spa is a can't-miss. Recover from your day (or night!) in the jetted tub. A connected Skytube stroll away from the lively Palms Casino, Palms Place Hotel & Spa offers an upscale, urban-chic counterpoint to the nonstop casino action next door. A ten-minute drive (or free shuttle ride) to the Strip, the 49-story tower has a sleek, city condo vibe, plus its own luxurious pool area. Cabanas are fully decked out with flat-screen TV, sectional-style sofa, ceiling fan, two reserved poolside loungers and a personal cabana host, who can arrange a poolside massage or place drink orders from the bar. (Fancy!) On your non-cabana days, feast on creative comfort food with pool views at Café 6. Pro tip: try the Dr. Pepper Shroom Burger, and hit happy hour for guest deals on craft beers, well drinks and “Mini Snackins” (upscale spin on bar nibbles). Drift Spa and Hammam opened with the city’s first Turkish steam bath, but also has hot and cool soaking pools, a traditional steam room, sauna, chill outdoor garden lounges and a fitness center. Feel free to mix things up with a visit to the (also amazing) two-story Recharge Salon & Fitness Center, located off the Palms Casino Floor. Check the schedule for spin, group yoga, or pilates classes at Nina Waldman’s Body in Mind Pilates Studio. Late-nighter? Hit the Rojo Lounge at Palms Place or head over to the main complex for more clubs. Studio and one-bedroom suites lean toward the luxe with Italian bedding by Mateo, full modern kitchens or kitchenettes, Serta Platinum pillowtop king size beds, rainfall showers, imported hardwood and marble floors, and even some with fireplaces. Sizes range from 615-1,220 square feet, all with spacious dining/living areas with 42-inch plasma TVs and twinkling nighttime city views. For infinitely more entertainment and dining options without leaving the Palms property, check out the Palms Pool & Dayclub, home to the famed “Ditch Fridays” pool party – champagne spray guns, DJs and celeb hosts, plus three bars and room for 3,000 guests(!) You’ll find daybeds, 27 cabanas and bottle service, plus an impressive dining/cocktail menu including 18 flavors of wings from Hooters – Habanero BBQ or Triple Dog Dare, anyone? Aspiring and accomplished musicians alike will be intrigued by the 24/7 onsite 8,000 square foot audio recording studio by Francis Manzella, where Lady Gaga (among other big names) has recorded. And the 14-screen movieplex is one of the only IMAX venues in town. Nove Italiano at the top of Palms Fantasy Tower was named the best Italian in Vegas by Zagat, while popular celeb hotspot N9NE Steakhouse on the casino floor was named a “Top 100 Restaurant in the World” by Conde Nast Traveler. For fancy French and amazing views, head for Alize atop the Palms Ivory Tower. Event fans will want to check the schedule at the 2,500-seat Pearl Theater, or The Lounge, which hosts everything from live music to comedy acts to fashion shows.